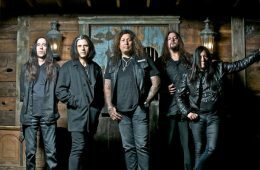 TESTAMENT singer Chuck Billy will make a guest appearance on the new album from Swedish metallers THE HAUNTED, due later in the year via Century Media Records. The song, tentatively titled "Trendkiller", has been described by producer Juan Urteaga, who recorded Billy's vocal tracks, as "sick as heck!" THE HAUNTED's new CD is being recorded at Antfarm studio in Åbyhøj, Arhus, Denmark with producer Tue Madsen. The band released a new three-song single, "Eye Of The Storm", on January 20 in Europe and January 21 in North America via Century Media Records. "Eye Of The Storm" was made available as limited-edition seven-inch EP (1,000 copies split as follows: 500 on black vinyl, 300 on red vinyl and 200 on white vinyl) and as digital single, featuring the new songs "Eye Of The Storm", "Infiltrator" and "My Enemy". "Eye Of The Storm" track listing: 01. Eye Of The Storm 02. Infiltrator 03. My Enemy The single marked the recording debut of THE HAUNTED's new lineup, which was announced last summer, featuring founding members Patrik Jensen (guitar) and Jonas Björler (bass), returning members Marco Aro (vocals) and Adrian Erlandsson (drums), as well as new guitarist Ola Englund. THE HAUNTED's 2014 lineup: * Patrik Jensen - Guitar * Ola Englund (SIX FEET UNDER, FEARED) - Guitar * Marco Aro (THE RESISTANCE, FACE DOWN) - Vocals * Jonas Björler - Bass * Adrian Erlandsson (AT THE GATES, PARADISE LOST) - Drums Vocalist Marco Aro (ex-FACE DOWN, also in THE RESISTANCE) was previously involved with THE HAUNTED for three acclaimed releases between 1999 and 2003 as well as for several worldwide touring campaigns. Drummer Adrian Erlandsson (also in AT THE GATES and PARADISE LOST) belonged to the original lineup of THE HAUNTED together the Björler twins after the demise of their previous legendary group, AT THE GATES. Together with Jensen, they launched THE HAUNTED's self-titled debut in 1998, an album which has been widely considered as the kick-start for a new era in the thrash metal movement and which, despite its initial underground status, climbed to be a massively inspirational record for a whole new generation of musicians and bands in the following decade. Guitarist Ola Englund is a highly talented young player from Sweden, who has recently been active as touring and recording member of U.S. death metal institution SIX FEET UNDER. "My Enemy", the new video from Swedish metallers THE HAUNTED, can be seen below. The clip for the relentless, 58-second track features rehearsal-room footage. THE HAUNTED released a new three-song single, "Eye Of The Storm", on January 20 in Europe and January 21 in North America via Century Media Records. "Eye Of The Storm" was made available as limited-edition seven-inch EP (1,000 copies split as follows: 500 on black vinyl, 300 on red vinyl and 200 on white vinyl) and as digital single, featuring the new songs "Eye Of The Storm", "Infiltrator" and "My Enemy". "Eye Of The Storm" track listing: 01. Eye Of The Storm 02. Infiltrator 03. My Enemy The single marks the recording debut of THE HAUNTED's new lineup, which was announced last summer, featuring founding members Patrik Jensen (guitar) and Jonas Björler (bass), returning members Marco Aro (vocals) and Adrian Erlandsson (drums), as well as new guitarist Ola Englund. 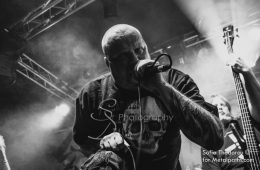 Commented THE HAUNTED's founding member and guitarist Patrik Jensen: "We are sure fans have been anxious to know what the band sounds like today after all the turmoil and old members leaving and new members joining. "We feel that these three songs represent the band perfectly. "We are currently working on the new album, an album that will be filled to the brim with what we know to be THE HAUNTED. "THE HAUNTED is back." THE HAUNTED's 2014 lineup: * Patrik Jensen - Guitar * Ola Englund (SIX FEET UNDER, FEARED) - Guitar * Marco Aro (THE RESISTANCE, FACE DOWN) - Vocals * Jonas Björler - Bass * Adrian Erlandsson (AT THE GATES, PARADISE LOST) - Drums THE HAUNTED will embark on a tour of Scandinavia this spring, beginning with a show in Gothenburg, Sweden on March 28. Says the band: "The reception of the three new songs from our newly released EP 'Eye Of The Storm' at 70000 Tons Of Metal was amazing, so expect them to be played, together with a truckload of other hard-hitters. "We can't wait to get back out there playing shows again, and we'll make sure it has been worth your while sticking around for us through thick and thin. See you all somewhere along the road!" 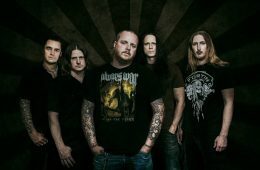 THE HAUNTED's founding member and guitarist Patrik Jensen stated about the band's new lineup: "THE HAUNTED went through some difficult times last year. Losing three band members is a pretty huge blow to any band. Jonas and I agreed immediately that we wanted to continue with the band, but we wanted to take our time and not rush into anything. "Some of you might recognize a few faces, some of you might not. Adrian Erlandsson is back on drums and Marco Aro is back on vocals. Adrian you might know from playing on our first album and Marco sang on 'The Haunted Made Me Do It', 'Live Rounds In Tokyo' and 'One Kill Wonder'. On guitar we also have Ola Englund bringing some pretty heavy chops to the band." Vocalist Marco Aro (ex-FACE DOWN, also in THE RESISTANCE) was previously involved with THE HAUNTED for three acclaimed releases between 1999 and 2003 as well as for several worldwide touring campaigns. Drummer Adrian Erlandsson (also in AT THE GATES and PARADISE LOST) belonged to the original lineup of THE HAUNTED together the Björler twins after the demise of their previous legendary group, AT THE GATES. Together with Jensen, they launched THE HAUNTED's self-titled debut in 1998, an album which has been widely considered as the kick-start for a new era in the thrash metal movement and which, despite its initial underground status, climbed to be a massively inspirational record for a whole new generation of musicians and bands in the following decade. Guitarist Ola Englund is a highly talented young player from Sweden, who has recently been active as touring and recording member of U.S. death metal institution SIX FEET UNDER. The new lineup of Swedish metallers THE HAUNTED made its live debut during the 2014 edition of "The World's Biggest Heavy Metal Cruise" — 70000 Tons Of Metal — which sailed January 27 to January 31 from Miami, Florida to Costa Maya, Mexico and back. Fan-filmed video footage of THE HAUNTED's performances aboard the cruise can be seen below. THE HAUNTED released a new three-song single, "Eye Of The Storm", on January 20 in Europe and January 21 in North America via Century Media Records. "Eye Of The Storm" was made available as limited-edition seven-inch EP (1,000 copies split as follows: 500 on black vinyl, 300 on red vinyl and 200 on white vinyl) and as digital single, featuring the new songs "Eye Of The Storm", "Infiltrator" and "My Enemy". "Eye Of The Storm" track listing: 01. Eye Of The Storm 02. Infiltrator 03. My Enemy The single marks the recording debut of THE HAUNTED's new lineup, which was announced last summer, featuring founding members Patrik Jensen (guitar) and Jonas Björler (bass), returning members Marco Aro (vocals) and Adrian Erlandsson (drums), as well as new guitarist Ola Englund. Commented THE HAUNTED's founding member and guitarist Patrik Jensen: "There aren't superlatives enough to describe how much the band has longed for these three songs to be released. "We are sure fans have been anxious to know what the band sounds like today after all the turmoil and old members leaving and new members joining. "We feel that these three songs represent the band perfectly. "We are currently working on the new album, an album that will be filled to the brim with what we know to be THE HAUNTED. "We'll start doing gigs this spring and we'll do festivals all over the place this summer. "Get in touch with the festivals you visit (and behave like an animal at) and tell them to get us on the bill! "THE HAUNTED is back. "Play it loud. No. Louder." THE HAUNTED's 2014 lineup: * Patrik Jensen - Guitar * Ola Englund (SIX FEET UNDER, FEARED) - Guitar * Marco Aro (THE RESISTANCE, FACE DOWN) - Vocals * Jonas Björler - Bass * Adrian Erlandsson (AT THE GATES, PARADISE LOST) - Drums THE HAUNTED's founding member and guitarist Patrik Jensen stated about the band's new lineup: "THE HAUNTED went through some difficult times last year. Losing three band members is a pretty huge blow to any band. Jonas and I agreed immediately that we wanted to continue with the band, but we wanted to take our time and not rush into anything. "Some of you might recognize a few faces, some of you might not. Adrian Erlandsson is back on drums and Marco Aro is back on vocals. Adrian you might know from playing on our first album and Marco sang on 'The Haunted Made Me Do It', 'Live Rounds In Tokyo' and 'One Kill Wonder'. On guitar we also have Ola Englund bringing some pretty heavy chops to the band. "We're all VERY excited about having THE HAUNTED back in working shape again and we can't wait to get back out on the road to play for our very patient and faithful fans again. A new album is also already in the works and if you are familiar with the individual band members of this new lineup, you can be assured that the new material will grab you by the throat from the get-go!" Vocalist Marco Aro (ex-FACE DOWN, also in THE RESISTANCE) was previously involved with THE HAUNTED for three acclaimed releases between 1999 and 2003 as well as for several worldwide touring campaigns. Drummer Adrian Erlandsson (also in AT THE GATES and PARADISE LOST) belonged to the original lineup of THE HAUNTED together the Björler twins after the demise of their previous legendary group, AT THE GATES. Together with Jensen, they launched THE HAUNTED's self-titled debut in 1998, an album which has been widely considered as the kick-start for a new era in the thrash metal movement and which, despite its initial underground status, climbed to be a massively inspirational record for a whole new generation of musicians and bands in the following decade. Guitarist Ola Englund is a highly talented young player from Sweden, who has recently been active as touring and recording member of U.S. death metal institution SIX FEET UNDER. Swedish metallers THE HAUNTED will release a new three-song single, "Eye Of The Storm", on January 20 in Europe and January 21 in North America via Century Media Records. The single’s cover artwork can be seen below. "Eye Of The Storm" will be made available as limited-edition seven-inch EP (1,000 copies split as follows: 500 on black vinyl, 300 on red vinyl and 200 on white vinyl) and as digital single, featuring the new songs "Eye Of The Storm", "Infiltrator" and "My Enemy". "Eye Of The Storm" track listing: 01. Eye Of The Storm 02. Infiltrator 03. My Enemy The "Eye Of The Storm" title track can be streamed in the YouTube clip below. The single marks the recording debut of THE HAUNTED's new lineup, which was announced last summer, featuring founding members Patrik Jensen (guitar) and Jonas Björler (bass), returning members Marco Aro (vocals) and Adrian Erlandsson (drums), as well as new guitarist Ola Englund. Commented THE HAUNTED's founding member and guitarist Patrik Jensen: "There aren't superlatives enough to describe how much the band has longed for these three songs to be released. "We are sure fans have been anxious to know what the band sounds like today after all the turmoil and old members leaving and new members joining. "We feel that these three songs represent the band perfectly. "We are currently working on the new album, an album that will be filled to the brim with what we know to be THE HAUNTED. "We'll start doing gigs this spring and we'll do festivals all over the place this summer. "Get in touch with the festivals you visit (and behave like an animal at) and tell them to get us on the bill! "THE HAUNTED is back. "Play it loud. No. Louder." The new lineup of THE HAUNTED will make its live debut during the 2014 edition of "The World's Biggest Heavy Metal Cruise" — 70000 Tons Of Metal — which will sail January 27 to January 31 from Miami, Florida to Costa Maya, Mexico and back. THE HAUNTED's 2014 lineup: * Patrik Jensen - Guitar * Ola Englund (SIX FEET UNDER, FEARED) - Guitar * Marco Aro (THE RESISTANCE, FACE DOWN) - Vocals * Jonas Björler - Bass * Adrian Erlandsson (AT THE GATES, PARADISE LOST) - Drums THE HAUNTED's founding member and guitarist Patrik Jensen stated about the band's new lineup: "THE HAUNTED went through some difficult times last year. Losing three band members is a pretty huge blow to any band. Jonas and I agreed immediately that we wanted to continue with the band, but we wanted to take our time and not rush into anything. "Some of you might recognize a few faces, some of you might not. Adrian Erlandsson is back on drums and Marco Aro is back on vocals. Adrian you might know from playing on our first album and Marco sang on 'The Haunted Made Me Do It', 'Live Rounds In Tokyo' and 'One Kill Wonder'. On guitar we also have Ola Englund bringing some pretty heavy chops to the band. "We're all VERY excited about having THE HAUNTED back in working shape again and we can't wait to get back out on the road to play for our very patient and faithful fans again. A new album is also already in the works and if you are familiar with the individual band members of this new lineup, you can be assured that the new material will grab you by the throat from the get-go!" Vocalist Marco Aro (ex-FACE DOWN, also in THE RESISTANCE) was previously involved with THE HAUNTED for three acclaimed releases between 1999 and 2003 as well as for several worldwide touring campaigns. Drummer Adrian Erlandsson (also in AT THE GATES and PARADISE LOST) belonged to the original lineup of THE HAUNTED together the Björler twins after the demise of their previous legendary group, AT THE GATES. Together with Jensen, they launched THE HAUNTED's self-titled debut in 1998, an album which has been widely considered as the kick-start for a new era in the thrash metal movement and which, despite its initial underground status, climbed to be a massively inspirational record for a whole new generation of musicians and bands in the following decade. Guitarist Ola Englund is a highly talented young player from Sweden, who has recently been active as touring and recording member of U.S. death metal institution SIX FEET UNDER. Swedish metallers THE HAUNTED will release a new three-song single, "Eye Of The Storm", on January 20 in Europe and January 21 in North America via Century Media Records. The single’s cover artwork can be seen below. "Eye Of The Storm" will be made available as limited-edition seven-inch EP (1,000 copies split as follows: 500 on black vinyl, 300 on red vinyl and 200 on white vinyl) and as digital single, featuring the new songs "Eye Of The Storm", "Infiltrator" and "My Enemy". You can pre-order the seven-inch single (in black or red vinyl versions) as well as the band's back catalogue for special reduced prices from CM Distro in Europe. The single marks the recording debut of THE HAUNTED's new lineup, which was announced last summer, featuring founding members Patrik Jensen (guitar) and Jonas Björler (bass), returning members Marco Aro (vocals) and Adrian Erlandsson (drums), as well as new guitarist Ola Englund. Commented THE HAUNTED's founding member and guitarist Patrik Jensen: "There aren't superlatives enough to describe how much the band has longed for these three songs to be released. "We are sure fans have been anxious to know what the band sounds like today after all the turmoil and old members leaving and new members joining. "We feel that these three songs represent the band perfectly. "We are currently working on the new album, an album that will be filled to the brim with what we know to be THE HAUNTED. "We'll start doing gigs this spring and we'll do festivals all over the place this summer. "Get in touch with the festivals you visit (and behave like an animal at) and tell them to get us on the bill! "THE HAUNTED is back. "Play it loud. No. Louder." The new lineup of THE HAUNTED will make its live debut during the 2014 edition of "The World's Biggest Heavy Metal Cruise" — 70000 Tons Of Metal — which will sail January 27 to January 31 from Miami, Florida to Costa Maya, Mexico and back. THE HAUNTED's 2014 lineup: * Patrik Jensen - Guitar * Ola Englund (SIX FEET UNDER, FEARED) - Guitar * Marco Aro (THE RESISTANCE, FACE DOWN) - Vocals * Jonas Björler - Bass * Adrian Erlandsson (AT THE GATES, PARADISE LOST) - Drums THE HAUNTED's founding member and guitarist Patrik Jensen stated about the band's new lineup: "THE HAUNTED went through some difficult times last year. Losing three band members is a pretty huge blow to any band. Jonas and I agreed immediately that we wanted to continue with the band, but we wanted to take our time and not rush into anything. "Some of you might recognize a few faces, some of you might not. Adrian Erlandsson is back on drums and Marco Aro is back on vocals. Adrian you might know from playing on our first album and Marco sang on 'The Haunted Made Me Do It', 'Live Rounds In Tokyo' and 'One Kill Wonder'. On guitar we also have Ola Englund bringing some pretty heavy chops to the band. "We're all VERY excited about having THE HAUNTED back in working shape again and we can't wait to get back out on the road to play for our very patient and faithful fans again. A new album is also already in the works and if you are familiar with the individual band members of this new lineup, you can be assured that the new material will grab you by the throat from the get-go!" Vocalist Marco Aro (ex-FACE DOWN, also in THE RESISTANCE) was previously involved with THE HAUNTED for three acclaimed releases between 1999 and 2003 as well as for several worldwide touring campaigns. Drummer Adrian Erlandsson (also in AT THE GATES and PARADISE LOST) belonged to the original lineup of THE HAUNTED together the Björler twins after the demise of their previous legendary group, AT THE GATES. Together with Jensen, they launched THE HAUNTED's self-titled debut in 1998, an album which has been widely considered as the kick-start for a new era in the thrash metal movement and which, despite its initial underground status, climbed to be a massively inspirational record for a whole new generation of musicians and bands in the following decade. Guitarist Ola Englund is a highly talented young player from Sweden, who has recently been active as touring and recording member of U.S. death metal institution SIX FEET UNDER.